MANILA — The head of a Philippine news website that has locked horns with President Rodrigo Duterte was freed on bail Thursday, a day after her widely condemned arrest on libel charges that critics say is a government effort to bully journalists. 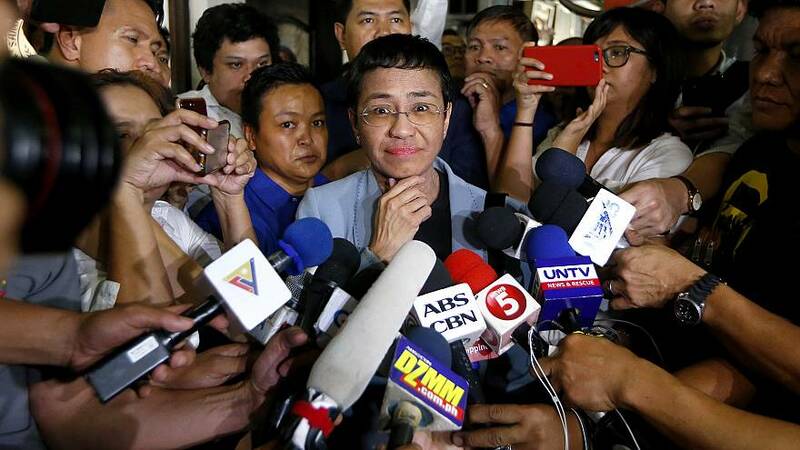 Maria Ressa, the award-winning head of news platform Rappler, was served a warrant live on television at her office on Wednesday for what media watchdogs said were trumped-up charges aimed at intimidating those who challenge Duterte's rule. "What we're seeing is death by a thousand cuts of our democracy," said Ressa, who was selected by Time magazine last year as one of its Persons of the Year. "You have to express outrage and do it now. Press freedom is not just about journalists, is not just about us, it's not just about me, it's not just about Rappler. Press freedom is the foundation of every single right of every Filipino to the truth," she told reporters after posting bail. Duterte has openly lambasted journalists who write unfavorable stories about him, including about his anti-drug campaign that has left thousands of mostly poor suspects dead. Ressa is accused of cyber libel over a 2012 Rappler article that linked a Filipino businessman to murder, human trafficking and drug smuggling. Rappler cited information contained in a 2002 intelligence report but did not say which agency compiled it. The businessman's lawyer says the information was wrong and that the article was defamatory and that he wants to clear his name. Duterte has made no secret of his annoyance at Rappler and has sparred frequently with its reporters, who are known for scrutinising his policies and his appointments and for questioning the accuracy of his sweeping, often bellicose statements. Rappler's reporting has accused his administration of creating a social media "ecosystem" designed to defend Duterte, threaten and discredit his opponents, and discourage Filipinos from criticising him for fear of being attacked by online trolls. The government denies the accusations. Duterte once suggested Rappler was American-owned and could therefore be linked to the U.S. Central Intelligence Agency. He called Rappler a "fake news outlet" and banned a reporter from covering his events. Rappler, founded in 2010, is no stranger to legal challenges and faces ongoing cases over tax evasion and alleged ownership violations. It denies wrongdoing and says it will not be cowed into self-censorship. This was the first time Ressa was arrested, although she said her release marked the sixth time she had been charged and granted bail. Duterte's spokesman, Salvador Panelo, said the libel case had nothing to do with the government and that Duterte had no interest in punishing journalists. "That's absolutely unrelated. The president has been criticised and he does not bother," he told DZMM radio. Ressa's brief detention was criticised by journalists and activists at home and abroad. Former U.S. Secretary of State Madeleine Albright said it was an "outrageous" arrest that "must be condemned by all democratic nations". Amnesty International Philippines said Ressa's arrest was based on a "trumped up libel charge." "This is brazenly politically motivated, and consistent with the authorities' threats and repeated targeting of Ressa and her team," it said. In its selection of Ressa as a Person of the Year, Time magazine cited her and several other journalists as "guardians" in what it said was an effort to emphasize the importance of reporters' work in an increasingly hostile world. Ressa, who has worked with CNN, also last year received a Press Freedom award from the New York-based Committee to Protect Journalists, and the International Center for Journalists' Knight International Journalism Award.